The Image Properties panel is displayed when you select (click on) an image inserted in your page. It corresponds to the <IMG> tag in the Tag Selector. In the Element ID text box (displayed in Simple view) enter the value for the id attribute. It will uniquely identify the element (image) in page. In the Width text box (displayed in Simple view) specify a new width for the selected image (in pixels). · If you do not specify any dimension in the Height text box as well (and leave the Constrain control to its default, namely the chain symbol), its value will be automatically calculated (according to the width you entered) and the image size will be modified proportionally. · If you also enter a value in the Height text box (after switching the Constrain control to the broken chain symbol), no automatic recalculation will be done this time (the image ratio and quality could get damaged if you enter both values). In the Height text box (displayed in Simple view) specify a new height for the selected image (in pixels). · If you do not specify any dimension in the Width text box as well (and leave the Constrain control to its default, namely the chain symbol), its value will be automatically calculated (according to the height you entered) and the image size will be modified proportionally. · If you also enter a value in the Width text box (after switching the Constrain control to the broken chain symbol), no automatic recalculation will be done this time (the image ratio and quality could get damaged if you enter both values). proportionally, make sure the chain symbol is displayed. Once you enter one of the dimensions, the other one will be automatically calculated so to maintain the proportion. not proportionally (independent dimensions), make sure the Constrain control displays the broken chain symbol. The Src text box (displayed in Simple view) displays the path on the remote server to the source image file. By clicking the Browse for Image button on the right, the Remote File Explorer window will display, giving you the possibility to replace the selected image with a new one of your choice. In the Link text box (displayed in Simple view) enter a correct URL to a web page or to a document on your remote server (you can use the Browse for File button on the right for this), and when clicking on the image, you will be redirected to that page/document. In the Border text box (displayed in Simple view) enter the thickness (in pixels) of the border that you want displayed around the image. The default value is 0 (no border is displayed). By clicking the Advanced button (displayed in Simple view), the Image Properties panel will switch to Advanced view. You will be offered the possibility of setting advanced options for the currently selected image. In the H Space text box (displayed in Advanced view) specify the horizontal distance (in pixels) between the image and the other page elements (images, table borders, text) to its left and right. These other page elements can be present in page or can be added at a later time: they will not get closer to the image than the horizontal space set. The default value is 0 (zero). In the V Space text box (displayed in Advanced view) specify the vertical distance (in pixels) between the image and the other page elements (images, table borders, text) above and below it. These other page elements can be present in page or can be added at a later time: they will not get closer to the image than the vertical space set. The default value is 0 (zero). 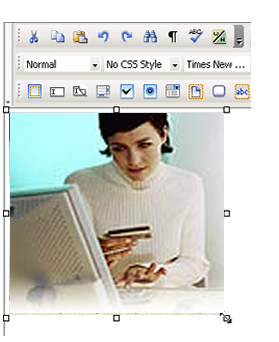 In the Alt text box (displayed in Advanced view) enter the alternative text (tooltip) to be displayed by browsers that do not support images. In most common browsers, this text also appears when the pointer is over the image. By clicking the Simple button (displayed in Advanced view), the Image Properties panel will switch to Simple view. You will be offered the possibility of setting various options for the currently selected image.